Our Southern California fencers competed in the Cadet Men’s and Women’s Epee Tournament this year and put up a great showing! In Cadet Women’s Epee, Madeline Kehl from Swords Fencing Studio put up a good pool round to end up in 13th place and earned a bye into the round of 64. Top 32 was within reach, but after being down and coming up to tie the score 14-14, top 32 slipped from her reach in priority. She finishes in 36th place after losing to Maria Kakirchenko from Georgia who finished in 8th place. Good job! Also in Cadet Women’s Epee, Kasia Nixon from Los Angeles International Fencing Center had an excellent pool round that had her as the number 2 seed and earning her a bye into the round of 64. In the round of 64, Kasia takes down Hyeonji Park from Korea 15-12. Her bout to get into the round of 16 against Hsin I Wu of Taipei was even easier as she rolled into the 16’s 15-5. Her toughest bout would be against Dominique Tannous from Libya where she would lose 14-15 and finish in 9th overall, where Tannous finished 6th. With her 9th place finish, Kasia gets a head start on the team points list for next year’s Cadet Epee team. Congratulations on an excellent tournament! In Cadet Men’s Epee, Jake Raynis also from Los Angeles International Fencing Center had a strong pool round to come out as the 13th seed and also earn a bye in the 64’s. His first opponent Gweonwoo Lee from Korea would be a small challenge as Jake wins 15-13. In the round of 32, Jake had an easier time with Noe Walter from Germany winning 15-8. Then Jake would run into Dylan French from Canada the number 4 seed, but he would also be unable to stop Jake from advancing into the top 8 with a 15-12 victory. Jake’s next bout to get to the semifinals would prove to be very tough and very close against Dzianis Paulouski from Belarus with Jake pulling out the victory 10-9. Jake Raynis would then fence the number 8 seed, Andris Jahimovics from Latvia, to get to the final and be the first of two USA Cadet Men’s Epee fencers in the finals this year. Jake and Andris parried well and touches went back and forth. Jake had the lead twice only to have Andris come back twice to tie up the bout 14-14. 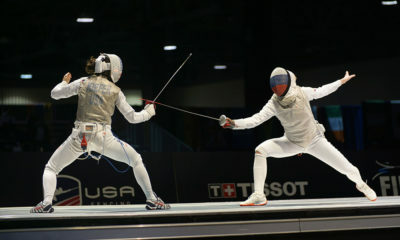 The fencers went into priority where unfortunately Jake loses 14-15 to the Latvian and ends up taking home Bronze. 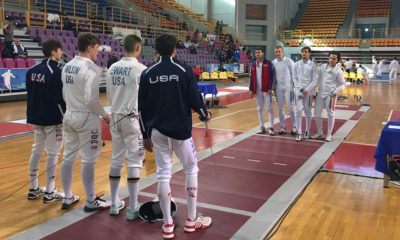 Ari Simmons from the US and Alliance Fencing Club would win the Gold leading to a Gold and Bronze finish for the US Cadet Men’s Epeeists. A really fantastic job well done by Jake Raynis with his excellent bronze finish! Congratulations to all of our SoCal fencers and keep up the good work!